The shots came close but did not hit the victim, according to the Atascadero Police Department. Hours later, police tracked down the alleged gunman and arrested him, as well as a female associate. At about 1:30 a.m., a physical fight broke out behind Whiskey & June at 5950 El Camino Real. 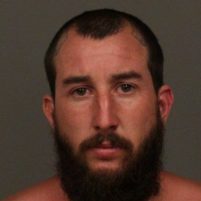 An Atascadero man later identified as Travis William Miller, 38, retrieved a handgun from his vehicle, pointed the firearm at the victim and fired a single round, a police department press release states. While investigating the shooting, police learned Miller has possible ties to the Vagos Motorcycle Gang. Atascadero police worked with San Luis Obispo County Sheriff’s deputies to confirm the ties. At 11:51 a.m., officers located a black truck at Olmeda and Rosario avenues. Miller was a passenger in the truck. Officers followed the truck and made a “high-risk stop” of the vehicle by Stow It Mini Storage. Officers arrested Miller and his associate, 23-year-old Nevada Skye Jones, of Atascadero, and booked them in SLO County Jail. Both Miller and Jones remain in custody with their bail set at $50,000. Police are recommending prosecutors file charges of assault with a deadly weapon and conspiracy. An investigation into the case is ongoing. Police are still trying to locate evidence and confirm Miller’s gang involvement. Good to see the partying remains robust at the old bar, once known as “Terry’s” (after the drunk who owned it) and now elevated to “Whisky and June’s.” Creative name but apparently the same crowd.